Drinking eggnog at Christmastime is a long-established American tradition and for our family it’s an essential seasonal tipple. Eggnog is a chilled milky punch mixed with eggs and laced with distilled liquors, such as whisky, bourbon, brandy or rum. Eggnog is usually drunk among gathered crowds in a wassailing manner – so it’s more likely to feature at a local community event or a house party than a cocktail bar (though many similar cocktails and liqueurs will be found on bar menus). The making of eggnog is an important ritual; each household has their own handed-down secret recipe. 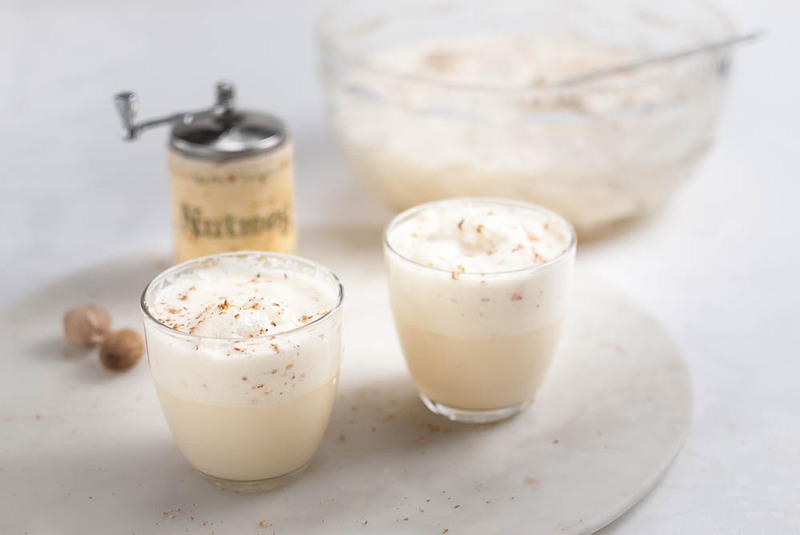 Whilst families may argue over the proportions of individual ingredients and whether bourbon is more authentic than whisky, most will agree on serving eggnog in a large punchbowl, finished with floating mounds of whipped egg whites dusted with nutmeg or cinnamon. The ceremonious punchbowl is an important part of the eggnog paraphernalia and traditionally accompanied by matching ladle and noggin-like cups. Our family owned a silver-plated set. Each year it was brought out from storage, carefully unwrapped from it protective tissue paper and methodically polished by hand in readiness for the end of year soirées for invited guests and neighbours. As children we were allowed to attend the peripheries of these parties, supping from our own little cups of a non-alcoholic eggnog. Eggnog’s background taste is rich, warm and complex with flavours of spice, caramel and crème anglaise. It’s so popular it now finds itself – without alcohol – in many American everyday drinks and foods, such as tea, coffee, custard puddings and ice cream. Happily, nobody in our family ever came to any harm drinking eggnog. Cheers.